The book of Ruth tells a smaller story within this larger narrative, showing God quietly at work in the lives of a few pious individuals, remaining true to his covenant and his people. Cundall and Morris place each book in its historical and canonical context, not only rendering each useful for scholarly study but also demonstrating their contemporary relevance. About "Judges & Ruth (Re-Formatted) (Tyndale Old Testament Commentary Re-issued/revised Series)"
The book of Judges presents Israel's human frailty, the nation's need for both spiritual and political deliverance, and God's use of flawed human leaders to guide and preserve his chosen people through a dark period of their history. 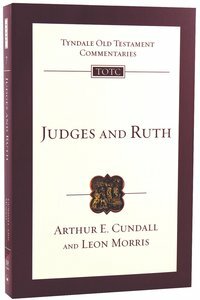 The book of Ruth tells a smaller story within this larger narrative, showing God quietly at work in the lives of a few pious individuals, remaining true to his covenant and his people.Arthur Cundall and Leon Morris join forces in this introduction and commentary to the books of Judges and Ruth. Cundall expounds and comments on Judges in a clear, straightforward style, giving a good overall perspective to the book's varied contents. In the introduction he discusses the place of the book in the canon, its composition structure and date, taking into account pertinent archaeological evidence. He also discusses briefly the political, religious and moral questions raised by the book.Morris follows the same pattern for Ruth. His introduction and commentary will appeal to both specialist and general reader as he discusses the problems of the book, showing the light shed on it by recent archaeological research. In particular he forcibly brings out the book's present relevance.The original, unrevised text of this volume has been completely retypeset and printed in a larger, more attractive format with the new cover design for the series. Leon Lamb Morris was an Australian New Testament scholar. He received his Ph.D. at the University of Cambridge which became his first major book, The Apostolic Preaching of the Cross. He served as Warden of Tyndale House, Cambridge (1960-64); Principal of Ridley College in Melbourne, Australia (where they have named a library in his honour); and Visiting Professor of New Testament at Trinity Evangelical Divinity School. He published numerous theological works and commentaries on the Bible, notable among which are The Atonement: Its Meaning and Significance, New Testament Theology, and The Gospel According to John and 1 and 2 Thessalonians (New International Commentary on the New Testament series) and The Gospel According to Matthew, and The Epistle to the Romans (Pillar Series). Morris was also the editor of the invaluable Tyndale Bible Commentary Series and the author of volumes on Luke, 1 Corinthians, 1 and 2 Thessalonians and Revelation.